Public internal conflicts: as is often the case in new parties, initial success attracts a lot of different constituencies, all bringing in their own and often conflicting ideas and opinions. In finalizing positions, this diversity naturally leads to conflicts with some of the members leaving the party again. However, in the case of the Pirate Party, the self-imposed radical transparency put all of these conflicts out in the public for anyone to see – in all its nastiness. Change in media narratives: in the beginning, the media framed awkward statements or lack of political positions as “interesting”, “fresh” or “authentic” (see, for example, an article in the quality daily Sueddeutsche in November 2011). As some prominent members such as Marina Weisband stepped down and the party began to drop in the polls, this narrative turned 180 degrees. Authentic and honest admittance of nescience suddenly became incompetent ignorance. As was the case in overly positive reporting before, narrative and change in polls fed on each other. 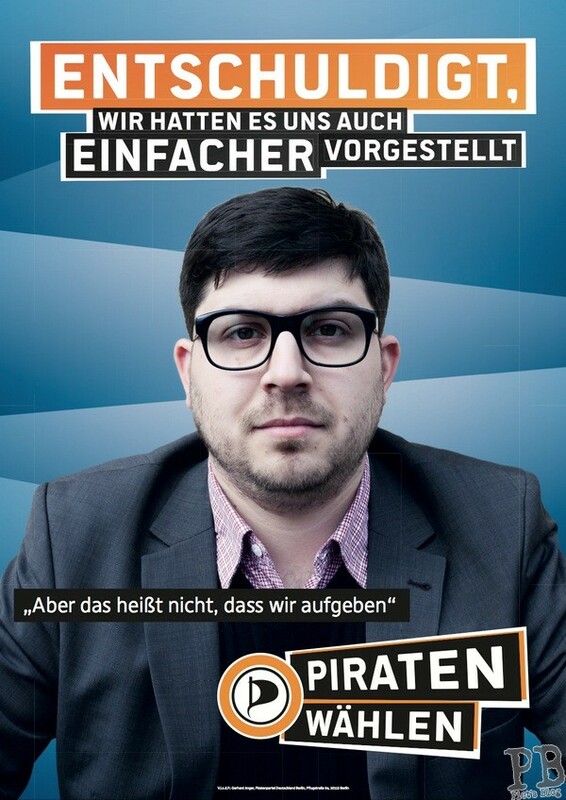 New protest party Alternative for Germany (AfD): part of the explantion of the Pirate Party’s success was their ability to collect protest votes (see also “German Pirates’ Winning Streak: More than Protest“). In this regard, the newly founded and Euro-critical AfD did a much better job this Sunday and nearly reached the five percent election threshold. Failure to deliver on promise of ‘liquid democracy‘: in addition to calls for copyright reform and government transparency, one of the core promises of the Pirate Party in Germany was to improve democratic participation with the help of new technological means. However, the party could not agree to implement a “permanent general assembly” with the help of its voting and discussion tool “liquid feedback“, thereby substantially undermining the credibility of calls for implementing similar tools elsewhere. Missed opportunity of the NSA scandal: even though the leaks by Edward Snowden directly addressed core issues of the Pirate Party movement such as privacy and anti-surveillance, the German Pirates were not able to capitalize on it. Different to the anti-ACTA protests (see “ACTA as a Case of Strategic Ambiguity“), where a clear goal (‘Stop ratification of ACTA!’) and a clear addressee (the European Parliament) helped to mobilize, the Pirate Party did not manage to identify an enemy or suggest measures. As if the German election outcomes had not been sobering enough, the international umbrella organization of the national Pirate Parties suffered another setback in the context of the World Intellectual Property Organization (WIPO). In early 2012, the Pirate Party International (PPI) had submitted its application for admittance as a Permanent Observer to the organization. Today, the current Assemblies of the Member States of WIPO denied PPI this status. Since the rules of procedure require an unanimous decision for granting permanent observer status, opposition by the USA and Poland was sufficient to prevent the PPI from being admitted. The Attorney General of WIPO stated in the meeting that he had no knowledge of such a precedent. However, there are indeed many: ECOSOC lists among their permanent Observers the Socialist International, Liberal International (both admitted in 1995) and Centrists Democrats International (1950). In fact, Socialist International is listed as a category I consultative member to the UN. There is even a precedent of UN cooperation with PPI itself, where Gregory Engels has been asked by UNESCO to participate in the conference on copyright reform in Marrakech in February 2013. As a result, PPI spokespersons such as Gregory Engels will still depend on cooperations with other NGOs to take part at WIPO assemblies in the future.